Note: The reviewer was provided with a complimentary copy of this product for review. Borderlands Adventure 1: Wreck in the Ring. Robert L.S. Weaver. 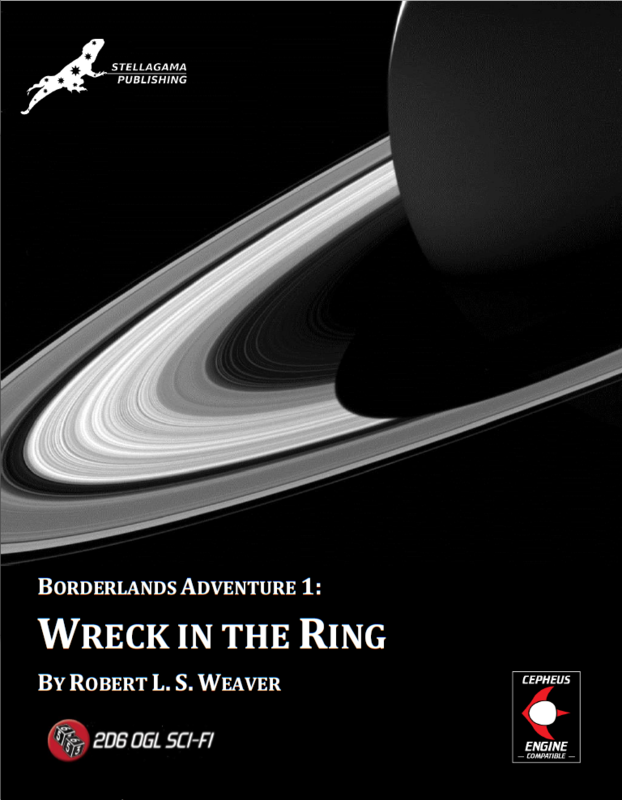 This short folio provides all the basic groundwork needed to run a recovery/salvage adventure (there is a legal distinction outlined in the appendix, but operationally they’re the same) in a gas giant’s ring system in an out-of-the-way system. The default setting is Stellagama’s These Stars Are Ours! [TSAO] universe, but there’s really nothing that can’t be trivially changed to support any other setting—and it will be equally easy to adjust it for any of what Freelance Traveller calls ‘Classic-compatible rule sets’. You’ll need a set of core rules—the author recommends Cepheus Engine or the Mongoose Traveller (1st Edition) SRD—and the usual appurtenances for playing a RPG. There are references to Cepheus Engine and the Cepheus Engine Vehicle Design System [VDS], and to TSAO, but the VDS and TSAO are not actually required for play. There are two pages of background information about the TSAO universe, but even this can be omitted if you set this adventure in a different setting. You get just under one page of description of the local setting, enough to be able to transplant it into any system that meets the most basic criteria: out of the way, formerly a way station on a trade route, with a ringed gas giant. It’s up to the referee to define the reason for the PCs—a party of three-to-five is recommended—are in the system, and why they’re approached by the patron (a belter) for the mission. Four NPCs are provided (not substitutes for a lack of PCs, and including the belter patron), each with their own reasons for wanting to be on this mission—and possibly operating at cross-purposes with each other and with the PCs. This is not a “safe” mission, where the PCs can work easily in a shirtsleeve environment; they will, of necessity, be in vacc suits and zero-G the entire time that they are active. This means tracking how long various actions take, and ensuring that the characters get adequate rest and that they do not exceed the “carrying capacity” of their suits. There is opportunity for conflict between the characters, but it’s unlikely that they will come to blows; the main source of danger is the environment, and that’s quite enough, thank you. There is an unexpected twist to the mission, that the characters won’t learn about until well into it. If they learn about it early enough, it could answer some questions they may or may not have thought to ask, and they can potentially profit from it; if not, those questions may remain unanswered (and the profit significantly reduced). A ship design is provided, with classic (non-isometric, grey-scale) deck plans, well-labeled and with supplemental markings showing adventure-specific information. Even this ship, however, can be replaced relatively easily by one of similar size and usage, if the referee chooses. There was a minor bit of confusion; while the the ship’s basic description calls it a “military transport”, the plan calls it a “passenger liner”. The adventure is quite well-written; even if a player reads it, and knows the ‘spoilers’ that I’ve avoided discussing here, it will still be very easy to get ‘into’ the adventure and enjoy it. It is not larded with extraneous information; there is plenty of room left to give the referee the freedom to customize the adventure to fit an existing campaign setting. There’s plenty of opportunity to build on this adventure, regardless of your campaign type or setting. It can provide a couple of evenings’ worth of adventure for a gaming group, or a good scenario for a convention setting. Recommendation: At only $4, skip the latte and grab a copy.